I’ve mentioned a few times on my blog now that I’ve switched up my skincare routine over the past couple of months to really focus on clearing up my acne scarring and any remaining blemishes I’m battling. During this time I’ve gradually added various products into my routine, but just after the travelling (and of course rubbish eating!) I did in New York I noticed my skin started to become a lot drier than usual and I realised I didn’t have a super hydrating moisturiser in my skincare stash. 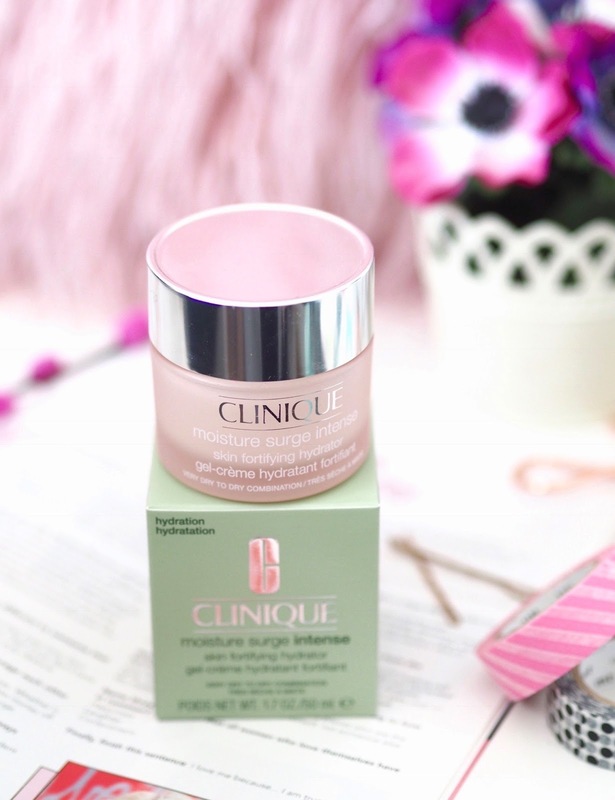 After some serious online research (I spend waaaay too much time reading reviews before actually purchasing) I decided to go for the Clinique Moisture Surge Intense. I’ve actually heard lots of people rave about this moisturiser before both in real life and online. I know it’s a firm favourite of many, especially those who travel often so I thought it was finally time I got round to giving it a go. Clinique actually offer this in two different types, the original Moisture Surge (for all skin types) and the Moisture Surge Intense (for very dry to dry combination skin), I went for the Intense version as my skin needed as much hydration as it could possibly get. The day I picked this up in Boots I literally couldn’t wait to get home and slather my face with the stuff – oh the glam. On the first night I tried it as my skin was so dry I decided to use it as more of a mask than a moisturiser, part of the reason I actually picked up the Intense version was so it could also double up as a mask if I liked it. So after following my usual skincare routine and applying serums etc I went in with a thicker than usual layer, nothing too extreme (lets be real, ya girl don’t have the budget to get through this stuff on the weekly) but I focused it on my driest areas. I stuck my hair in a messy bun and ta dah, I headed off to bed looking like some kind of alien monster hybrid you fear lives under your bed. The following day I woke up and when I saw my skin in the mirror I took a little double take. Normally I’m bright red, blotchy and my skin looks so dull first thing in the morning but my skin actually looked pretty damn good (if I do say so myself). The biggest improvement was in the hydration and plumpness in my skin, and it certainly was a lot calmer than it usually was. It was like a litre of water for my skin and I was sold, but I was just hoping the results were here to stay! So it’s been just over 6 weeks now and I feel like I’ve given it enough time to share my opinion and I’m absolutely loving it. This moisturiser has been the only one I’ve used both morning and evening since adding it to my routine. It works well as my AM moisturiser even for my combination skin and it makes the perfect base under foundation, it really does leave the skin looking more plump and I have noticed my foundation goes on a lot smoother. I have sensitive skin that can often break out with new products but luckily this hasn’t been an issue, praise the skincare lords. The texture is somewhat unique, I’ve not tried anything like this before. It’s has a creme-gel consistency that’s thicker than most moisturisers I’ve tried but it still feels so lightweight being part gel. It glides onto the skin easily and feels really cooling which I happen to love. When I apply my usual daily amount it absorbs into the skin well but I have noticed a thicker layer can sit on the skin which is something to mention, but then when you’re applying a thicker layer that’s what you’d expect. The packaging feels luxe, the only issue would be that jar packaging isn’t always the most hygienic but aslong as you’re going in with a clean finger I think you’ll be fine. 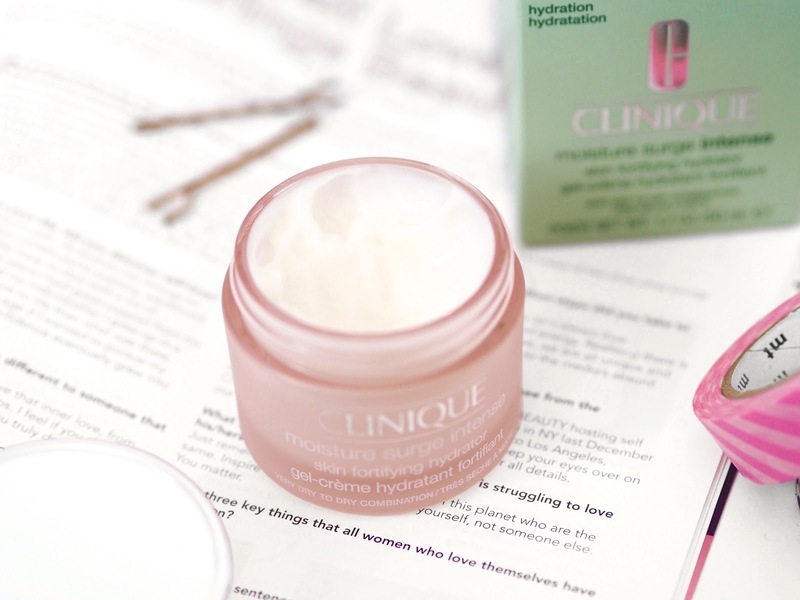 So as you can tell I’ve fallen head over heels in love with the Clinique Moisture Surge Intense and I just can’t get enough of the stuff! Whilst it’s on the pricey side I’ll happily pay that for the results, I can’t believe how calming it is on my usually bright red face and dry patches are a thing of the past! Have you tried it? Or if not what’s your holy grail moisturiser?